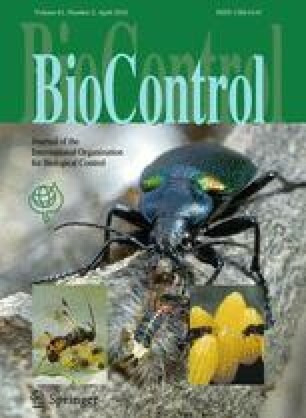 Entomopathogenic nematodes (EPN) applied inundatively to suppress insect pests are more likely to persist and establish in stable agroecosystems than in annual crops. We investigated a system of intermediate stability: three stumps harbouring the large pine weevil (Hylobius abietis L.; Coleoptera: Curculionidae), a major European forestry pest. We tested whether persistence of EPN Steinernema carpocapsae Weiser (Rhabditida: Steinernematidae) applied around stumps is maintained by recycling of EPN through pine weevils developing within stumps. Steinernema carpocapsae was detected in soil around and under the bark of treated tree stumps up to two years, but not 4–5 years after application. Differences in nematode presence between sites were better explained by tree species (pine or spruce) than soil type (mineral or peat). Presence of S. carpocapsae in soil was positively correlated with the number of H. abietis emerging from untreated stumps the previous year, which was greater for pine stumps than spruce stumps. We thank the Irish Environmental Protection Agency (EPA) and the Department of Environment, Heritage and Local Government (DoEHLG) for support. This study was funded by the EPA STRIVE Programme (Project Code 2007-PhD-B-6) under the National Development Plan 2007–2013. Nematodes were applied under license (TA003) from the Pesticide Control Services of the Irish Department of Agriculture and Food. Coillte Teoranta provided clearfell sites and Dr Aoife Dillon at the Coillte Forest Protection Section provided information and technical advice on the sites.